OSHA Delays I2P2 Rule Once More! In what seems to be a trend, OSHA has again delayed its rulemaking process for an Injury and Illness Prevention Program (commonly known as I2P2) standard. The announcement came during a National Advisory Committee on Occupational Safety and Health meeting in late June. According to OSHA officials, we should not expect the next rulemaking phase, a small business review process, to begin until at least Labor Day. I2P2 programs, which aim to reduce workplace injuries by requiring employers to proactively find and fix workplace hazards, have been on OSHA’s regulatory radar for quite some time. To justify the Agency’s most recent delay, an OSHA official explained that OSHA is still ironing out the proposal it plans to present to the SBREFA panel. OSHA stressed that it wants to deliver a “complete” proposal, including a range of alternatives that the Agency is considering. Excuses aside, OSHA’s inability to get past this early step in the rulemaking process signals a long and difficult road ahead for the I2P2 rule. 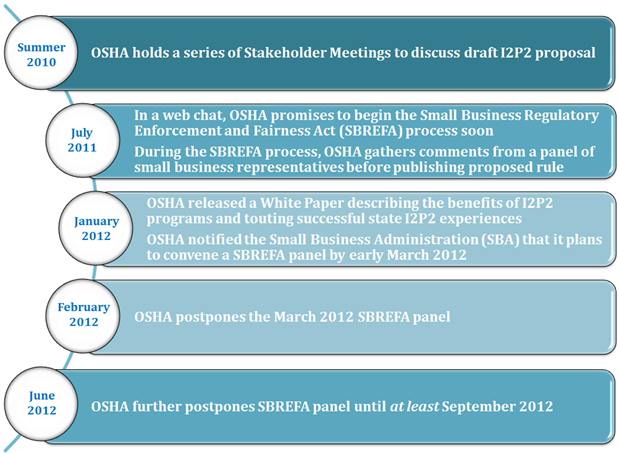 After OSHA convenes the SBREFA panel, it still has to publish its proposed rule and solicit stakeholder comments before releasing a final rule. Based on the time-consuming nature of this process and the delays we have already seen from OSHA, we probably will not see substantial movement on the rule until 2013. Still, it is never too early for employers to start preparing. Further, an I2P2 rule will likely draw from current voluntary consensus standards for I2P2 programs, such as the ANSI/AIHA Z10 and the OSHAS 18001 standards, as well as state I2P2 laws and regulations (34 states currently incentivize or require employers to implement I2P2 programs through legislation or regulation). No matter the Rule’s ultimate requirements, employer compliance will be crucial. The I2P2 rule has the potential to become one of the most frequently used weapons in OSHA’s enforcement arsenal. For example, if a workplace injury occurs, OSHA may not only cite the employer under applicable hazard-specific standard, it will likely also tack on an I2P2 violation. Alternatively, if a workplace injury occurs, but there is no hazard-specific standard for OSHA to cite, OSHA will rely on the I2P2 rule to impose fines against employers. In either case, OSHA’s reasoning would be that the injury never would have happened if the employer had an adequate I2P2 program in place. This type of enforcement pattern is already playing out at the state plan level. Consider California for example, where employers have been subject to a state I2P2 standard since 1991. Twenty-one years later, California’s I2P2 standard is the most frequently cited standard. The bottom line is that although OSHA may not issue a final I2P2 rule until sometime in 2013, or later, employers should consider the potential far-reaching implications of the rule for safety, their budgets, and their reputations. Source: Bonnie I. Scott, a Summer Associate (not admitted to the practice of law) in Epstein Becker Green’s Washington, DC, office, contributed significantly to the preparation of this post.